The BMW i8 has spawned soft-top derv that isn’t without flaws, but there’s still much to like about it. After selling the i8 plug-in hybrid sports car for over four years as a coupe, BMW has added a new version in open-top guise. Although the basic package of the i8 Roadster is generally the same as in the i8 Coupe, the soft-top relative is a strict two-seater (hence the Roadster badge and not Convertible) so that the roof can tuck away into where the rear seats would usually be located. The design of the i8 Roadster isn’t exactly the same whereby two shapely cowls are situated just behind the small rear windscreen. Then there are some splashes of the Roadster badge finished with material made to look like brushed metal. Since the i8 Roadster appeared when the i8 Coupe reached mid-life, it gets an improved lithium ion battery. 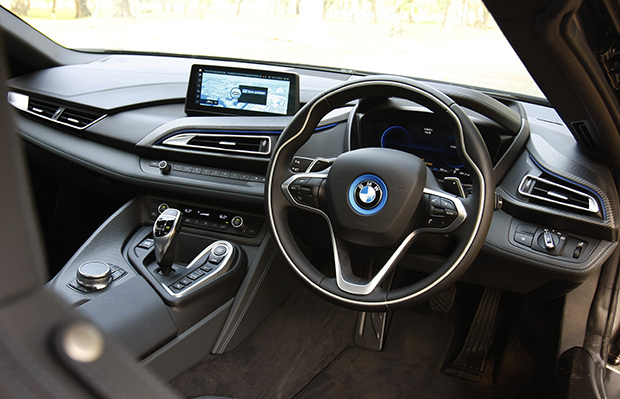 Compared with the pre-facelift i8 Coupe, the rating of the battery has increased from 7.1kWh to 11.6kWh. This allows electric power to rise from 131hp to 143hp and CO2-less driving range from 37km to 53km. The internal combustion engine remains: 231hp 1.5-litre three-cylinder petrol-turbo. It’s mated to six-speed torque-converter automatic driving the rear wheels. 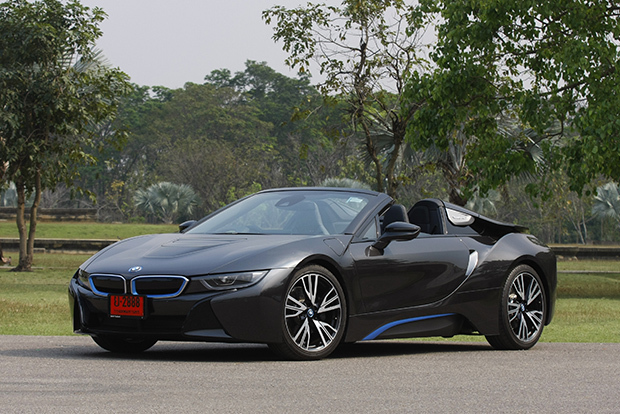 The price of the i8 Roadster has been set at 12.959 million baht, which is 1.16 million baht more than the pre-facelift i8 Coupe that’s still on sale in Thailand. This may just be another variation of the same theme, but the i8 Roadster isn’t merely a soft-top version of the coupe sibling. Those aforementioned cowls lend it a unique appearance, be it with the roof up or down. 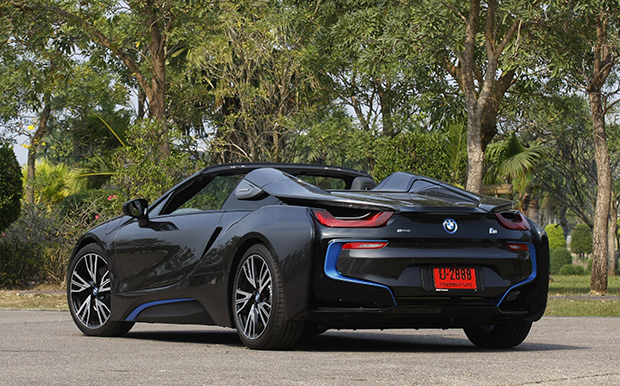 The inherently wide and low stance of the i8 completes the car’s appeal on the road. Although you can still hear some of the outside in the typical fashion of soft-tops, the i8 Roadster’s body structure feels impressively stable at high speeds. Virtually no scuttle shake can be noticed. It’s nice that BMW has fitted a better battery because it’s the all-electric driving ability that makes the i8 feel special (in either Coupe or Roadster forms). And apart from the responsive performance, the i8 glides into corners with natural front/rear handling balance thanks to its mid-engined layout and the electric motor driving the front wheels essentially making it all-wheel drive. As well, you don’t feel the weight penalty of the batteries because the i8’s body is, after all, made from carbonfibre. When the i8 first appeared on the market, there was only energy-saving skinny tyres available. Now there are wider ones that help lift its visual dynamism without really harming the ride. While those dihedral doors certainly look cool when you exit the car, they are part of a problem when it comes to day-to-day use. Those portals need more opening space than usual in parking lots. As well, the high sills make entry and egress not hassle-free. Whether the absence of rear (doggie) seats in the i8 Roadster matters is for you to decide. 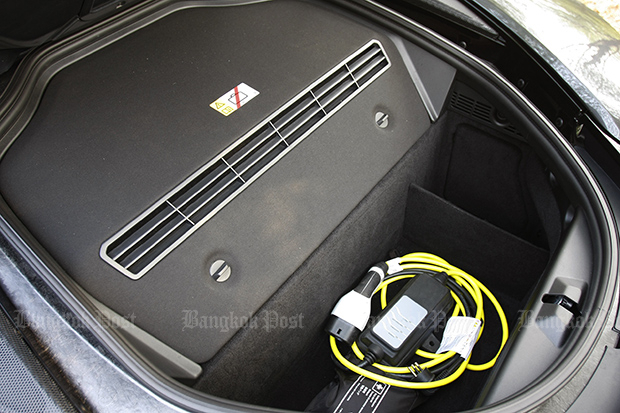 But the space left behind the front chairs is more like a shelf rather than a compartment to securely place things; boot space is already limited due to the engine placed mid-ship and electrical system up front. Like the exterior, the interior is nicely trimmed and penned to look both racy and futuristic. But go into detail and you’ll note that the i8 Roadster is based on a package that’s isn’t particularly new anymore. The automatic gearbox operates only six forward ratios, there’s no brake-hold function for urban driving and the head-up display and drive-mode selector feel like a generation behind. When the i8 made its maiden appearance, we named it as the sports car of the future. That should remain the case today made even better with this new open-top option to choose from. But we’d reckon that the regular coupe body, that should still be slightly cheaper in price with the upgraded battery, would suffice more to the average i8 punter. Although hearing a glorious engine isn’t part of the open-top driving experience in the i8 Roadster, feeling the wind in a serene manner may appeal to some. The choice is yours. 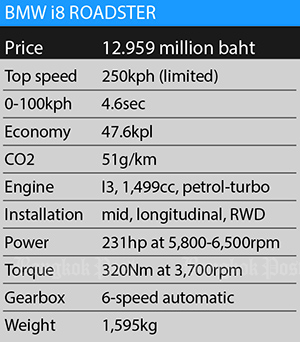 At 13 million baht, the BMW i8 faces several kinds of competition if you don’t consider what kind of technology is firing up the driving fun. If you want brand image and iconic appeal, there’s the effervescent 911 from Porsche. Need some fearsome performance? The Nissan GTR will more than suffice, not to mention the more practical and understated BMW M5 and Mercedes-AMG E63 S with over 600hp. Or if you’re too lazy to walk out of the showroom after inquiring about the i8, there’s the new 8 Series in M850i outfit that’s fairly quick with 530hp of V8 turbo power. 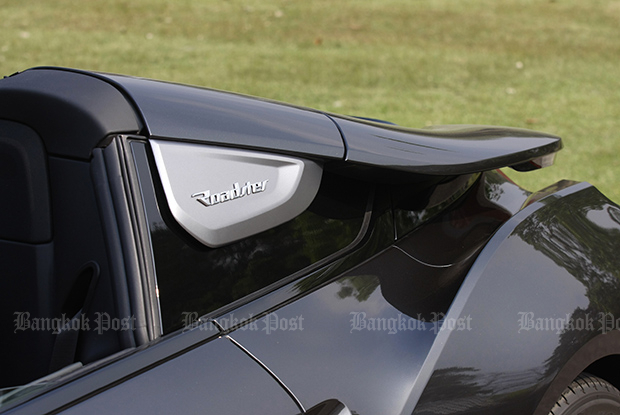 The only alternative in this price neighbourhood that comes closest to the i8 in concept is the Honda NSX, which wooed the Thai public at last month’s Motor Expo without putting a price on itself (expected to cost around 15 million baht if sold officially). The mid-engined NSX features a hybrid combining 3.5-litre twin-turbo V6 and three electric motors to help push power up to around 580hp. With high performance in mind, the NSX can cover the 0-100kph time in less than three seconds. Although the i8 may not be as quick, it’s still respectably quick and has the advantage of being partially driven in pure electric mode (hence its plug-in facility which the NSX doesn’t have). Moreover, the i8 has really underscored the engine-downsizing principle with a puny 1.5-litre turbocharged triple that still gives satisfying performance. A carbonfibre bodywork rounds off its technological prowess and its unique position in the sports car market.